The plaque commemorates all who served in the 2nd / 25th Infantry Battalion during World War Two. 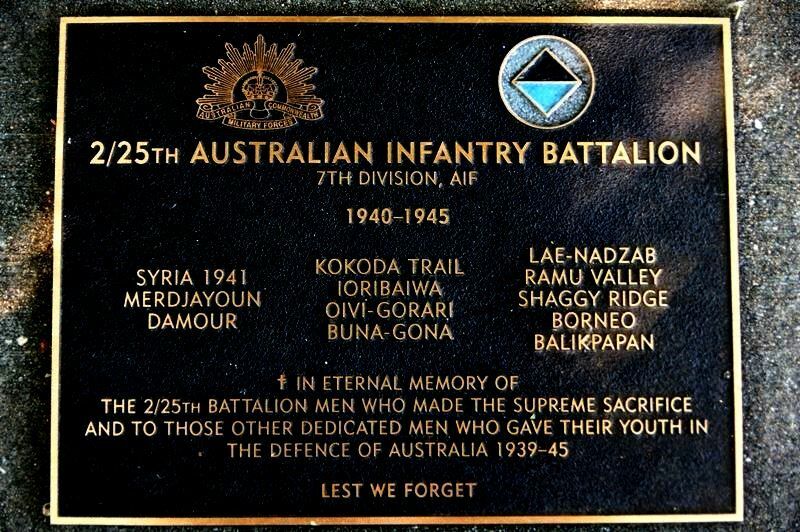 The Battalion was raised in 1940, the battalion took part in the fighting in North Africa and Syria in 1941 before returning to Australia in 1942 to fight against the Japanese. Following this it took part in the fighting in New Guinea, undertaking two deployments there, firstly in 1942 and 1943 and then again in 1943 and 1944, before taking part in the Borneo campaign in 1945. The battalion was disbanded in early 1946.